Meridian tapping techniques; EFT, Pro EFT™ and MTT are accupressure-type (tapping) techniques that help dislodge blocked energy throughout the body. Tapping has been successful in neutralizing negative emotions such as; stress, anxiety, frustration, resentment, grief, shame, guilt, anger phobias and so much more. When used by skilled professionals, EFT can alliviate many unwanted behavioral issues such as clutter, procrastination, addictions, self-sabotage, smoking, weight issues and more. Tapping has also been shown to be highly effective for a multitude of physical ailments including pain, headaches, migraines, asthma, allergies, and a variety of other issues. 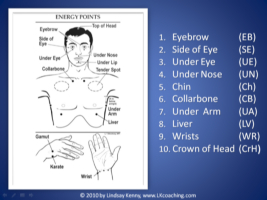 Energy Psychology works by stimulating (tapping) specific energy points that are near to the surface of the skin. The vibration or percusion from systematic tapping sends signals throughout our meridian system alterning neural pathways and releasing emotions trapped in our energy system. Click on the audio link below to hear what psychiatrist, Dr. Carl Drake, M.D. says about Tapping. It's a fact that our emotional health plays an important role in our physical well being. Just think about how your heart pounds when you’re frightened, how you cry or get a lump in your throat when you’re sad, how your palms become sweaty when you’re anxious, and how your stomach gets upset for a variety of emotional reasons. In fact, stress in its various forms, also shows up as indigestion, headaches, grinding of the teeth, adrenal fatigue, and a litany of other ailments. While it's obvious that emotions affect us physically, it's only been in the last deck or so that the medical community has acknowledged that emotional issues are important factors in our physical health. Left untreated, negative emotions can have a devastating impact on our long term health. Ulcers, high blood pressure, depression, auto-immune ailments and other serious illnesses are often serious ramifications from ignored emotional issues. "Some day the medical profession will wake up and realize that unresolved emotional issues are the main cause of 85% of all illnesses. When they do, tapping will be one of their primary healing tools...as it is for me. I frequently use EFT for my patients with great results." Eric Robins, MD, board certified physician and Pro EFT Level 3 graduate. It's difficult to comprehend the power of these extraordinary energy release processes until you have experienced them yourself. But please do read what others say about their experiences with these extraordinary processes. Once you learn the basic skills and methods of tapping, you will be equipped with one of the most effective tools for personal transformation and healing ever developed. If you take the time to learn how to use Pro EFT™ or other tapping techniques you will be able to apply it to yourself to dissipate many of life's emotional and physical challenges such as anger, frustration, stress, anxiety, fear, grief, chronic pain, and more. You will need a skilled practitioner, however, for multi-faceted issues such as procrastination, weight, clutter, stuck issues, addictions, chronic illness and other complex issues. You cannot truly understand the astonishing "magic" of tapping until you experience it yourself. As a friend of mine once said "I don't need to know how electricity works to know that my lights will come on when I flip the switch". Once you have experienced tapping, you won't care how it works, you'll just be very grateful that it does work. The best way to experience Pro EFT the first time is with an experienced practitioner. encompasses all of them; EFT, Pro EFT, BASF, EMDR, TFT, TAT and others. Similar to acupressure, you simply tap very lightly on specific meridian points, mostly on the upper body and face. The different component is verbally expressing the emotion or event that is upsettin. Combined with tapping, this sends tiny shock waves or soothing pulses throughout the meridian system. By performing this systematic stimulating or tapping of the meridian points, (about 14 in all), while addressing a specific problem, the emotional issue gradually disappears. This simple process balances and re-energizes the system, often in a matter of minutes, clearing blockages and dissipating the negative emotions as you do so. Lindsay Kenny is not a licensed health care professional and offers Pro-EFT as an EFT Master and Life Coach. If you would like to find another Pro-EFT practitioner who may be closer to your home area, try our Preferred Practitoners, trained by Lindsay Kenny.